A couple of days ago I wrote my review for Simply 7 chips. On the review I told everyone that I would be offering a great giveaway! Here is the giveaway - check it out! Also, at the bottom of the giveaway I have added Simply 7 reviews from all across the United States. 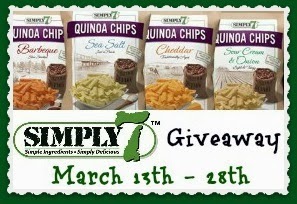 If you have a minute click on a few of the reviews...see how others love Simply 7 Chips! The Pitch List Bloggers are excited to introduce you to their newest chip! Quinoa flour is a flour produced from quinoa, a grain-like seed native to the Andes of South America. Quinoa has a very high protein content, naturally gluten-free, and high in dietary fiber. CASE of SIMPLY 7 Chips! Plus make sure to check out the great reviews on the linky below the Rafflecopter Giveaway! See how reviewers from across the USA feel about Simply 7 Chips! a Rafflecopter giveaway Pitch List Members are not responsible for shipment of prizes. We will work with the company to ensure winners receive their prize timely but as a Pitch List member we have no control over prize shipments. My favorite is the Tomato Basil Hummus Chips. I think I would like to try one of each LOL. But if I had to narrow it down, I would try the BBQ first. i'm all about pomegranate so i'd want to try that first. looks delish! that looks great! I love quinoa but haven't heard of this. bbq sounds yummy! The cheddar ones sound good to me! I'd like to try the Cheddar I think. Oooh, I love everything that is sea salt flavored. Love sea salt. I have never seen these before but I want to try them! i LOVE these chips! They are so yummy and so good for you! Thanks for the fun giveaway! Sour Cream and Onion would probably be my favorite. A close second would be the cheddar. I will have to see if they sell these near where I live. They all sound good, but tomato basil would be my choice. Yum! The Sour Cream & Onion Would Be My Pick They Sound Yummy!! I can't wait to try the quinoa chips! I think my daughter would like to try the barbecue flavored ones! I like the Sour Cream and Onion but would love to try the Cheddar ones. these sounds like a nice alternative to greasy chips! I honestly can't wait to try these! My favorite is the Bruschetta Lentils Chips. I wonder what a quinoa taste like. I eat quinoa all the time, but have never had it in a chip. I think I'd be all over the cheddar flavor. Those sound so good and I love to crunch! I'd hear about this brand before and I'd love to try it. I think I'd go for the classic cheddar flavor. I absolutely love simply 7 chips! They are amazing and so good for you! yummy! Did you know they had Chocolate. I think it is Dark Chocolate.. but it is chocolate! The Creamy Dill Lentil chips look so good! The Tomato Basil sound Yum! I didn't know they had Quinoa Chips, that's awesome! I'm entering, thanks for hosting. I have never even heard of this and after seeing the flavors would love to try some! I think I would go with creamy dill or the sour cream and onion! Yum! These sounds delicious. I'm always looking for a healthier snack option. Not only for myself but for my family as well. I've never had these! Going to have to try them! These sound really good! I have never had this brand or Quinoa chips. The flavors looks tasty though. I would love to replace the greasy unhealthy chips with these. These chips sound so good, I love trying new snacks! Thanks for hosting the awesome giveaway! Quinoa is something that I have eaten for quite a few years and is becoming much more popular. Used to be hard to find, now getting easier. I love that these are cholesterol free! I need to try them out! I have never heard of quinoa chips, but gosh that sounds good! These look so good! I love quinoa! So many great flavors! I'd love to try the White Cheddar flavor. Oh my daughter has been wanting these! They sound delish. I'd have to have the cheddar to get the kids and Hubs to try them. I love the sea salt ones. They are super yummy with salsa or dip! I'd love to try the dill lentil ones. I love dill anything! I would totally like the sea salt ones. They would be great with a dip I make. I love quinoa but i've never had them as a chip. These look great, my favorite would probably be the sea salt. Quinoa seems to be the latest health rage. I'd love to try the sea salt variety. I want to try the cheddar Quinoa Chips! Either Hummus or Lentil sound delicious, I love them both. I think my favorite is the pomegranate sea salt flavor. I love anything seasoned with sea salt. Thank you. I love quinoa! I had no idea they made chips out of it though. I'll have to add these to my shopping list. I think the Cheddar sounds great! I would love to try the bruschetta chips. I'd love to try the Red Pepper Hummus chips! Hi, My favorite flavor chip is white cheddar. Thanks for the Giveaway. My favorite would be the new sour cream and onion flavor. I adore the creamy dill lentil chips!